How to decorate your baby’s first bedroom? To want is to be able, that is the attitude. Not because you do not have a small house or a small space you must give up the dream of any woman: have her own dressing room. There are endless ways to create a space for our clothes and accessories, and not all have to be the same. We would all like to be Carrie Bradshaw and have her dressing room, however, we have to adapt to the space that we have. 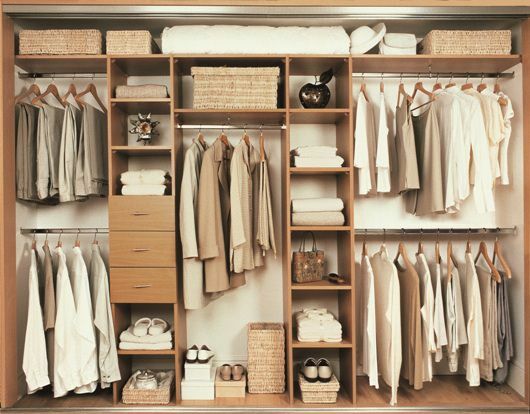 But do not worry, because here we leave you some dressing room ideas so you can take advantage of the space to the maximum and have your own closet. One of the most decisive options is the open dressing room. It has everything very convenient, so it is a very practical way to organize our things. We can put a normal bar and go hanging hangers, or we can opt for more original options like using a not very thick wooden trunk instead of the classic bar. The open dressing rooms also have detractors, who believe that there is not enough privacy since the clothes are exposed as if it were a store. The closed dressing room is the most classic option. It may not be as original or as practical as an open dressing room, but it certainly offers much more intimacy. We can create them from screens, which always allow us to create several rooms in the same room, curtains or even erect walls of plasterboard. This way we can separate the dressing area from the rest of the room. It can also be created in a passage area, which is a space that is usually very poorly used. A wide hallway is a perfect area to create a closet. We can even use both sides of the wall: in one we put bars with hanging clothes and on the other shelves with the shoes organized in the purest style ‘dream dressing’. If we want a little more intimacy we can cover it with curtains and it will go much more unnoticed. Those lucky enough to have spare rooms in their home can create a theater dressing room. Normally you put all the clothes hanging in the cabinets, which may have doors or not, and in the middle placed a pouf or an ‘island’ where we can place our accessories or just sit down while we choose our outfit.